Ask a child to design a robot, and they’ll produce a drawing that looks a little like you or I—the parts may be gray and boxy, but it will have two arms, two legs, and a head (probably with an antenna coming out of the top). Starting from the beginning of robotics, the human form has seemed like an excellent starting point. One of the best places to draw inspiration for robotic design, however, is the kingdom of insects, arachnids, snails, and slugs. Here’s a simple question: how do you walk? It’s not by putting one foot in front of another. You walk by falling, and then catching yourself. This is a really complex movement, which has been best described by mathematical models that describe the human body as an inverted pendulum. Therefore, it’s safe to say that walking upright is not an easy challenge for robots to master. A recent DARPA robotics challenge—showcasing the most advanced humanoid robots on Earth—still saw nearly half of the contestants fall flat on their faces. Designing robots to imitate humans—or any mammal—is a huge challenge. Our gait, our musculature, even the ways we see the world are all vastly more complicated than any machine we’ve ever made. Insects are simpler creatures by contrast, and therefore are much easier to replicate. 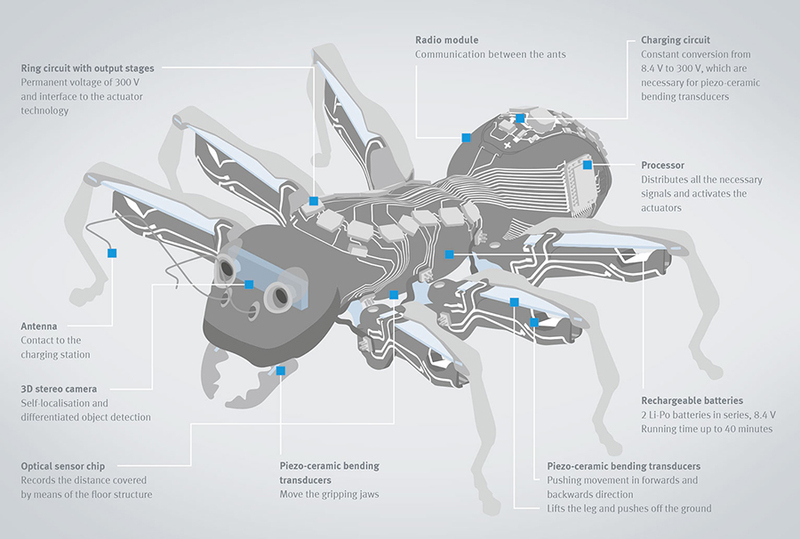 Here are a few reasons why a budding robot designer should study insects. First of all, insects get a lot of mobility out of small bodies with simple joints. Better still, they’re robust—a ladybug can fly into a window, bounce off, and keep going. Small, mobile, and durable—all of these qualities represent admirable characteristics in a practical robot. Small robots can be produced easily en masse, which can also lend itself to useful applications. By mimicking the swarming behavior of a cockroach, the makers of a robot known as Velociroach hope to use their tiny robots as rescue workers. Small robots can easily crawl through the cracks and crevices of a collapsed building in order to locate survivors and notify rescue workers. Similarly, small insect bodies equate to small insect brains. While this isn’t likely to be much help to an insect in an IQ test, it’s a great way for engineers to study the secrets of robot autonomy. Despite their small brains, insects can avoid predators and display complex behavior. Even a creature as simple as a maggot—with just 10,000 neurons—can still learn relatively complex tasks, and can actually be trained to a certain extent. Insects are simple enough that a myriad of insect-inspired robots have already made it from the drawing board into real life. Researchers from Seoul University have made a robot, for example, that takes its cues from the water strider—it can literally jump on water. Sensors based on light-sensing organs found in insects have been used to stabilize drones. Other robots have demonstrated the ability to swarm like ants. When designing a robot, it makes sense to copy simpler organisms first, and then move on to more complex organisms. Robotics engineers have already learned a great deal from insects, and this knowledge lends itself to advancements in both mechanics and artificial intelligence.